Developing The Person: We are determined to have a positive influence on the holistic development of every child, teach essential life skills and inspire our athletes to seek excellence in all aspects of their lives. Developing The Athlete: Our goal is to unlock the full potential of every child in a safe, positive and educational environment. Our goal is to guide every individual to their full potential, as people and athletes, and let team results take care of themselves. Although we will always play to win, winning is secondary to the overall development of every player who wears the ESC jersey. 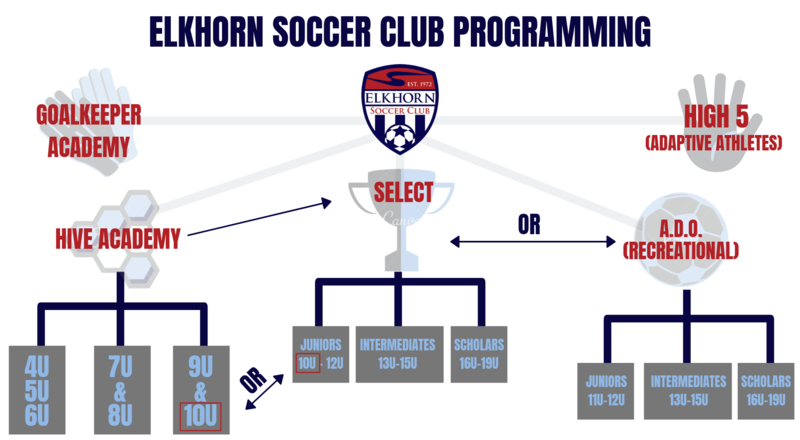 "Developing a Culture of Excellence"
Elkhorn Soccer Club leads the community in providing players with an opportunity to play competitive or developmental soccer. Players attain the appropriate environment commensurate with ability, potential, and interest. 1. We will prioritize a culture of sharing ideas and best practices to elevate each other as people and coaches. 2. We will demonstrate courtesy and respect towards everyone involved in the game. 3. We will develop a culture of excellence by holding ourselves to our own high standards. 4. We will be open, transparent and frequent communicators. 5. We will always represent the club in a positive and professional manner. 6. We will promote and demonstrate kindness and sportsmanship. 7. Our decisions will be made with the best interests of the players and the club in mind. 8. We will be life-long learners of the game and continually seek ways to improve. 9. We will work in a collegial manner in order to develop our players and advance the club. 10. We will not measure success by wins and losses. We will measure it by our attitude, effort, and commitment. Winning will always be a byproduct if we do the right things. We will never sacrifice development for results. 12. We will always operate within the rules and spirit of the game and teach our players to do the same. 13. We will strive to be excellent instructors and positive role models. 15. We will educate our families on soccer development.